When the sphynx is next to you the world changes to the best. Better than the sphynx there can be only one more sphynx. 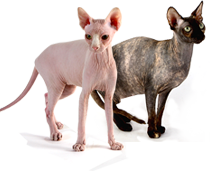 Welcome to the website of Canadian Sphynx Cattery. We are mono-breed cattery, that means we work only with Canadian Sphynx breed. We are located in Riga (Latvia, EU). Cattery is registred in WCF (Germany, EU). All kittens have vaccines and are tamed to use nail sharpener, are tamed to use the toilet and are socialy adapted. Our animals live together with us. We vare completely against cages. Kittens get along with kids very well and are not affraid of dogs. We have a german shepard in the house. "J" litter has been born - 23.05.2017. Mother - Felisa Roza Kaira - world champion (WCH). Father - Roza Kaira Jingle Bells - world champion (WCH). Jasmine - Female sphynx - white with green eyes - (w62). Jennifer - Female sphynx - white with green eyes - (w62). Junior - Male sphynx - white with different eyes - (w63). Julietta - Female sphynx - white with blue eyes - (w61). Jessika - Female sphynx - white with blue eyes - (w61). "I" litter has been born - 28.05.2016. Mother - Aleksa Point Buffy - Baltic InterChampion (ICH). Father - Roza Kaira Jingle Bells - world champion (WCH). Infinity - Female sphynx - black turtle with green eyes - (F). Inferno - Male sphynx - lilic with green eyes - (C). Iceberga - Female sphynx - white with blue eyes - (w61). "H" litter has been born - 26.05.2016. Hennessy - Male sphynx - white with different eyes - (w63). "G" litter has been born - 22.10.2015. Mother - Aleksa Point Buffy - International champion (ICH). Father - Roza Kaira Jingle Bells - (WCH). "F" litter has been born - 23.10.2014. Forbes - Male sphynx - white with different eyes - (w63). Frosty - Female sphynx - white with blue eyes - (w61). Ferrari - Female sphynx - black turtle with green eyes - (F). "E" litter has been born - 23.10.2014. Exclusive - Male sphynx - white with blue eyes - (w61). Extra - Female sphynx - white with green eyes - (w62). Elvis - Male sphynx - white with green eyes - (w64). Ember - Female sphynx - white with different eyes - (w63). Enigma - Female sphynx - white with different eyes - (w63). Elizabeth - Female sphynx - white with blue eyes - (w67). "C" litter has been born - 08.11.2013. CHARLES (CALI - new name) - Male sphynx - white with different eyes - (w63). DOLORES - Female sphynx - white with blue eyes - (w61). CESAR - Male sphynx - white with blue eyes - (w61). CARAMELE - Female Sphynx - white with different eyes - (w63). CHANEL (chocolat) - Female Sphynx - Chocolate, very rare color for the Sphynx with green eyes - (f). "D" litter has been born - 11.11.2013. DOBBY - Male sphynx - lilic with green eyes - (c). DEBORA - Female sphynx - white with blue eyes - (e). DOROTY - Female sphynx - white with different eyes - (w62). DONNA - Female sphynx - white with green eyes - (e). Kittens leave home with a European Veterinary passport, fully vaccinated, with a chip and with a pedigree (knitting is registered in club, planned). The kittens are accustomed to the toilet and scratching points. Sphynx kittens are accustomed to dry food as (we use only professional food, which guarantee a balanced diet) and a regular food (like meat, chicken). Kittens grow up with children and are very much focused on communication with people. Completely socialized. Kittens live with an adult German Shepherd dog and therefore are not afraid of dogs. The owners of our kittens can always get professional advice on the management and growth of our pets. We have possibility to bring your kitten straight to Moscow and St. Petersburg. Our animals are constantly taking part in international exhibitions and receiving high marks. We are totally against keeping animals in cages and against pulling out the claws! Canadian Sphynx - a cat that does not leave anyone indifferent. Generally people are divided into two camps. Some love the "fluffy", and can not understand why people buy a hairless cat. But others - just can not hide their delight at the sight of this alien creature. Sphynx - this is a unique and mysterious cat, hairless, always with big ears (the ears are bigger - the more valuable), with skin that is collected in the folds. Such an unusual look is combined with an equally unusual for a cat character. Sphynx will not tolerate being alone. Your Sphynx will always seek dialogue. Sphynx will suffer a lot if you do not have time to communicate with him, because it is a very loving cat. It is worth to have Sphynx for those people who are willing to communicate with the cat. Often "dog lovers" decide to have Sphynx, people who are used to spend a lot of time to communicate with animals. By Buying a Sphynx you should understand that you are not buying just a bald cat, but most importantly, a cat with a certain character. As a result of breeding there are certain qualities assigned in Canadian Sphynx. This is a cat to talk, the cat - a companion. Once upon a time people wanted to breed foxes that would be friendly to man. During the breeding was selected those individuals who showed no aggression toward humans. After generation came out that the foxes that have been more friendly had a bad hair and was almost yellow colored. That is, the selection was made primarily on the basis of character, and it turned out, that changed and external data. It's worth to remember when buying a kitten. Purebred Canadian Sphynx - this is a very friendly cat. From January 2011 Canadian Sphynx kitten parents can only be Canadian Sphynxes. Cross-breeding with other breeds of bald cats is prohibited. 2011 © RIGA LUX. All rights reserved.